The contents of a sampling net left in the water for 24 hours. From left to right: a red plastic fragment, a white plastic jar and a trigger fish. 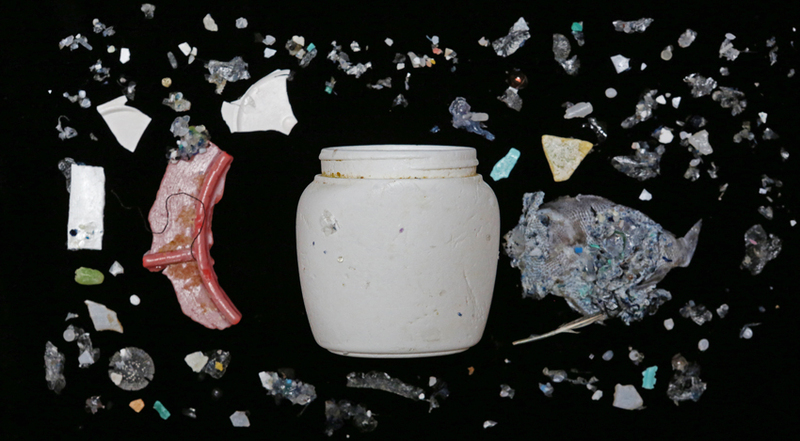 The surrounding particles include plastic pieces and marine life. On our penultimate night at sea, Marcus recapped our findings from the past four weeks. During the 3,800 mile expedition, we observed over 690 items floating at sea and collected hundreds more fragments from 29 trawls. From bottle caps, toothbrushes, plastic fragments, buoys and rope to a Japanese fishing boat, we’ve watched a dizzying array of debris float past the ship. Some of it, like the tatami mat and Bridgestone tire, were almost certainly swept away during the tsunami. Others, like the hundreds of plastic fragments Marcus collected in the manta trawls, could have been in the ocean for decades before we stumbled upon them. Mandy Barker, a crew member and artist who has been photographing the debris for a forthcoming collection, has taken photos of the fragments we’ve retrieved in Marcus’ high speed trawl. Once Marcus drops the trawl into the water, he leaves it there for 24 hours and then empties the contents onto a mesh screen. Mandy has been taking those fragments and photographing them on a piece of black velvet as a way to record what we’ve seen. The images are stunning, not least for their ability to show how plastic out numbers marine life in each sample. As a parting gift, Marcus poured samples into eleven jars for each of us to take home. Mine is sitting, wrapped in a plastic diaper, in my carry-on bag. I imagine where I’ll put it when I get home—perhaps on my bookshelf next to copies of The Great Gatsby, The Better Angels of Our Nature and a collection of Lorrie Moore’s short stories or maybe on my nightstand or on a cool dry shelf in my closet. There’s really no good place to store a jar full of seawater and marine debris, that haunting reminder of the millions of pieces of trash that drift into the ocean each year. Some of it is undoubtedly mine, a guilt I cannot surmount nor easily assuage.